Sonia Angus: Ludic Qualities and AIDA. AIDA is an acronym for a list of events companies aim to fulfil when marketing a product. Firstly they grab the customer’s attention through their advert. By pushing the irrational benefits of the product and demonstrating these they gain customer interest. They must then create a desire for the product make the customer think the product will fulfil their needs and improve their life. Action is where a customer is led in someway to purchase the product. In the book ‘The Tipping Point’ by Malcolm Gladwell this was know as ‘the golden box theory’ when people participated with the advert sales would go up. 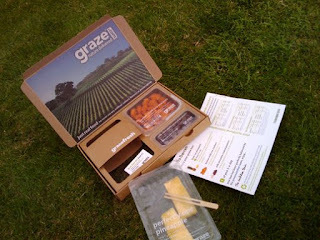 The company ‘Graze’ which sells healthy snack products is example of AIDA being used. By advertising in magazines such as ‘Grazia’ and ‘Mens Health’ they targeted the market segment they wanted and grabbed their attention. I would describe the market segment to be both male and female between the ages of 25 and 40, with disposable income, health conscious and living a busy lifestyle. An alternative to biscuits, having a healthy lifestyle, snacking but not in a harmful way, naturally active ingredients, more consistent energy, getting your five a day, are all benefits that are pushed to create customer interest. The desire is then generated through these benefits. By buying this product I can snack throughout the day but not feel guilty and become a healthier more alert person. The product is also delivered direct to my door so will fit in with my hectic lifestyle. ‘Graze’ then encourage these people to buy the product by giving them a promotional code to get their first box free the second half price. Most people love a freebie so would sign up for this. 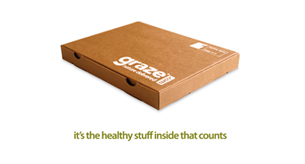 Whilst doing so they need to enter payment details this is because after they have received their free box ‘Graze’ will continue to send the box but charge the customer for it if they have not cancelled their account. This has a number of advantages for the company. Once a customer has tried the free box they may find out how much they like it and continue to buy from them. If a customer forgets or can’t be bothered to cancel their account the company will still gain by selling more boxes. Another technique used by advertisers to grab a customer’s attention is to create adverts with a ludic quality. This can be an ad that’s slightly puzzling, that has a hidden message or a pun, or an ad that’s funny or ridiculous. These ads will make people feel good about themselves; if you work out the puzzle you’ll feel proud. If they feel good about themselves they’ll feel good about the product. If an ad is funny or completely ridiculous the idea is to get people talking about it. Having the ad and the product talked about and constantly on people’s minds will result in people eventually buying the product. Sneaky, sneaky! A couple of ads I thought of that had this ludic quality are; the ‘Gu’ ad and the ‘Evian’ babies ad. Maybe it was just me that found the ‘Gu’ ad particularly puzzling... have a look!